The Rev. H. S. Millward. The Rev. 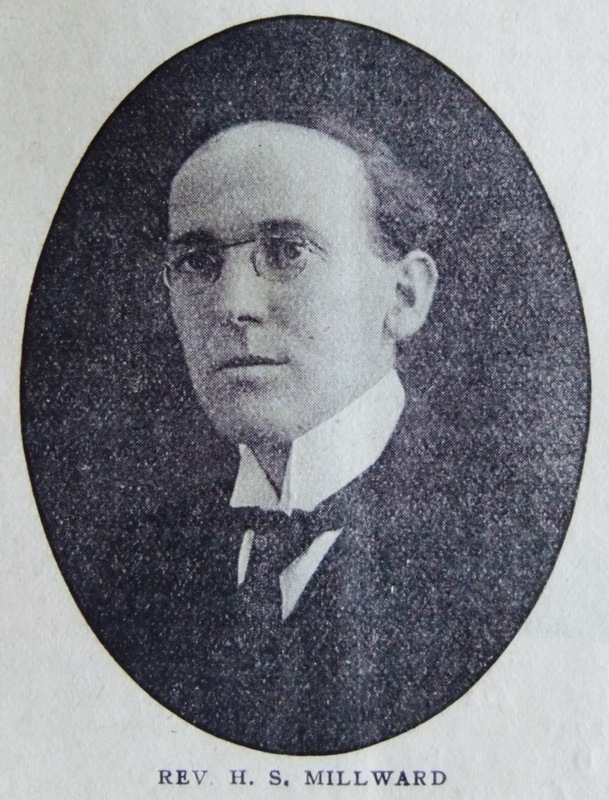 H. S. Millward owes a great deal of the marked success that has attended his ministry to his own exertions, but he acknowledges with increasing gratitude his debt to his parents. His father, an honoured and beloved worker in our Newcastle-under-Lyme Church, (Staffs) was a man of much culture, and widely read in the poets and essayists, and he saw to it that his son should receive the best training his means could provide. This opportunity was taken hold of by the young student, who became an assistant master, and received a special prize from the hands of Sir Oliver Lodge for work done at Wedgwood Institute, Burslem. Three years at Hartley College completed the beginning of an equipment which Mr. Millward has been improving ever since. A Preacher of The Word. First and foremost in his conception of the work he is called to do, Mr. Millward sets the preaching of the Gospel. To this high duty he brings his best, to the enrichment of the people to whom he ministers, and who, in the spheres where he has laboured, pay grateful tribute to the inspiring quality of his messages. Southend-on-Sea, York (Monkgate), Redditch, Leominster and Currock have in turn been strengthened by his work, not only by his pastoral oversight, his attention to business, his increasing power in the pulpit, but particularly by his devotion to the young people. He has given special care to children’s addresses, and these have been a greatly enjoyed feature of his Sunday morning services everywhere. No church has given more valuable help to outside organisations than ours, and although Mr. Millward is still youthful in the ministry he has taken his place on the roll. At Leominster he was the President of the Free Church Council, and served as Secretary of the Herefordshire Federation of Free Church Councils. On occasions he has been called upon to preach the Mayor’s sermon, and he has been an eagerly welcomed preacher and speaker in other churches and on other platforms than our own. During the later period of the war he edited a local newspaper, and is the present C.E. Secretary of his District, which sent him to Conference last year. Mr. Millward removes to Derby Second (Kedleston Street) next year, where he and his devoted wife will find every opportunity for the full use of every gift they possess, and where we feel sure they will both enjoy increasing success. Herbert was born in 1885 at Newcastle under Lyme, Staffordshire, to parents Thomas George and Annie. In 1901, Thomas was a gas and rent collector. Herbert married Florence Fox (1890-1987) in the spring of 1914 at York, Yorkshire. Birth records identify one child. Herbert died on 29 March 1969 at Norwich, Norfolk. Thanks for pointing out the typo. Further investigation identifies that Basil was born on 18 December 1917. Herbert Sydney would be my Great. Great uncle I am not sure if the date of birth of Basil his son is correct at 1818, as Herbert’s date of birth is down as 1885. Could this possibly be a typo? Maybe it should read 1918!